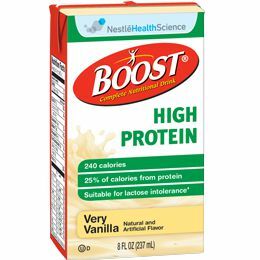 The Nestle Boost High Protein Very Vanilla 8oz Tetra Brik Each, Model #4390094139, is anchored in advanced science and research. Nestle Healthcare Nutrition offers nutritional solutions for people with specific dietary needs related to illness, disease states or the special challenges of different life stages. The Nestle Boost High Protein Very Vanilla 8oz Tetra Brik Each contains 15 grams of high-quality protein to help maintain muscle. Boost High Protein has 26 vitamins and minerals and is an excelent source of antioxidants (Selenium and Vitamins C &E). Contains Calcilock blend of essential nutrients to help support bone health. Ingredients: Water, Sugar, Corn Syrup, Milk Protein Concentrate, Vegetable Oil (Canola, High Oleic Sunflower, Corn), Soy Protein Isolate, Calcium Caseinate, Sodium Caseinate,and less than 0.5% of Potassium Citrate, Magnesium Chloride, Magnesium Phosphate, Calcium Phosphate, Salt, Cellulose Gel And Gum, Soy Lecithin, Sodium Ascorbate, Choline Bitartrate, Natural And Artificial Flavor, Alpha-Tocopheryl Acetate, Ascorbic Acid, Carrageenan, Potassium Chloride, Ferrous Sulfate, Zinc Sulfate,Vitamin A Palmitate, Niacinamide, Vitamin D3, Calcium Pantothenate, Manganese Sulfate, Copper Sulfate, Pyridoxine Hydrochloride, Thiamine Hydrochloride, Beta Carotene, Riboflavin, Chromium Chloride, Folic Acid, Biotin, Potassium Iodide, Vitamin K1, Sodium Selenite, Sodium Molybdate, Vitamin B12.